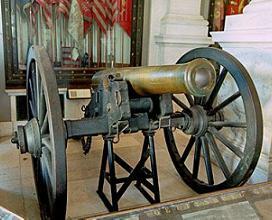 (The Rhode Island General Assembly) This Napoleon, was attached to Battery B 1st Rhode Island Light Artillery. On the third day of the Battle of Gettysburg, during the Pickett-Pettigrew Charge, this piece was directly struck by enemy fire, killing several cannoneers. When the remaining members of the gun crew attempted to resume firing, they found that the barrel had been warped by the enemy round, and that the piece could not be loaded. The new round became lodged in the muzzle. As the barrel cooled, the muzzle shrank and the new round became perminently embedded. In 1874, the piece was brought back to Rhode Island and put on display in the State House were it remains today.